Preloaded 8.8 or 10.9 bolts should be used. Sp,Rd see Table 3.4. The design tensile force At,Ed should include any force due to prying action, see 3.11. Bolts subjected to both shear force and tensile force should also satisfy the criteria given in Table 3.4. 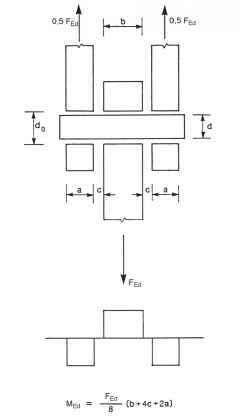 NOTE: When the preload is not explicitly used in the design calculations for shear resistances but is required for execution purposes or as a quality measure (e.g. fordurability) then the level of preload can be specified in the National Annex. (1) Minimum and maximum spacing and end and edge distances for bolts and rivets are given in Table 3.3. (2) Minimum and maximum spacing, end and edge distances for structures subjected to fatigue, see EN 1993-1-9.